On Tuesday, October 21, Fort Lauderdale Commissioners will vote on a proposed ordinance that will severely limit the capabilities of groups to distribute food to people experiencing homelessness. According to our research, over 30 American cities that have tried to introduce similar legislation in the past two years. 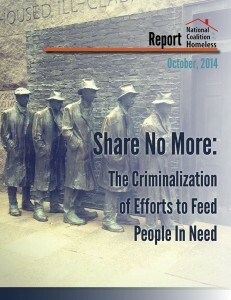 The new report, Share No More: The Criminalization of Efforts to Feed People In Need, documents the recent known cases of food-sharing restrictions throughout the country. Since January 2013, 21 cities have restricted the practice of sharing food with people who are experiencing homelessness while at least ten others have introduced ordinances that are pending approval. These restrictions primarily come about in three different forms; the first is by restricting the use of public property. In this scenario, individuals and organizations are generally required to obtain a permit, often for a fee, to share food in a park or in another public space. 12 cities have recently passed legislation that imposes this type of restriction. The second type of legislative restriction is to require groups to comply with city/county/state food-safety regulations. Since January 2013, four cities have passed legislation that required individuals and organizations to comply with their food-safety regulations when sharing food with people experiencing homelessness. The last method utilized to deter food-sharing are community actions driven by the principle of “Not In My Back Yard (NIMBY)”. Often, local businesses and homeowners do not want to attract people experiencing homelessness to their community join together to put pressure on local government or directly on individuals and organizations that share food with people experiencing homelessness. These groups are harassed and in result feel compelled to relocate their food-sharing efforts or cut the program all together. 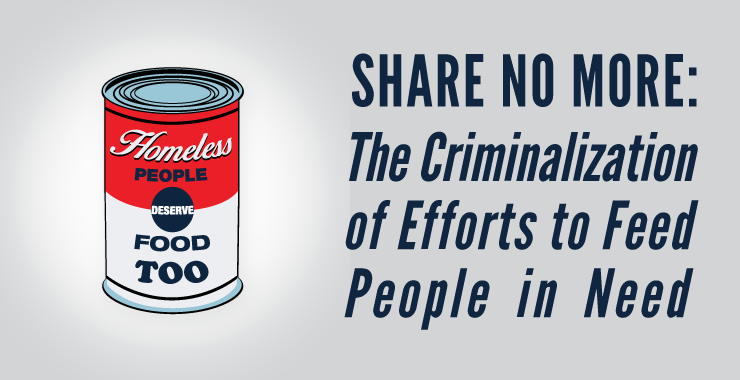 Since January 2013, four cities have successfully utilized this tactic, with local community pressure, to pass legislation to restrict sharing food with people experiencing homelessness. This year’s food-sharing report attempts to address the myths and motivations that often drive the demand for food-sharing restrictions. While the evidence is overwhelming that this practice is too common, there are some success stories that prove that these restrictions do not need to stand. Citizens can use the same community pressure to stop these laws from taking effect. Some faith-based organizations have led the fight to protect their First Amendment Right to openly practice their religion. There are a number of policies we can advocate for on the local, state, and federal level to protect the civil rights of those experiencing homelessness. Since January, 2013 the following 22 cities have passed ordinances that restrict the food-sharing process. For more information about food-sharing restrictions please read this year’s report and/or contact the National Coalition for the Homeless.